Presentation of a mural to Côte St. Luc. It depicts members of the club and their wives. From left, president of the Men’s Club Syd Kronish, Mayor Anthony Housefather, artist Phil Kurtz, wife Eleanor. 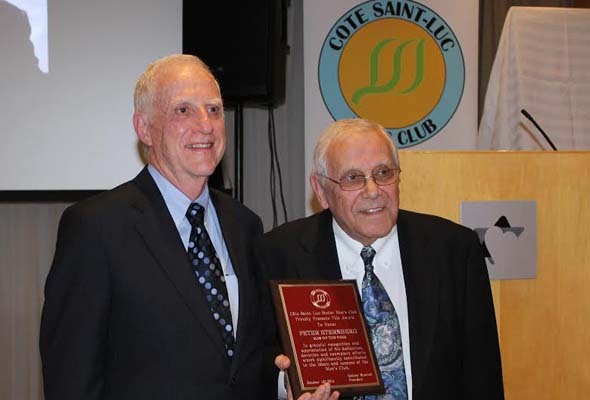 The Côte St. Luc Senior Men’s Club held an outstanding end-of-year Gala at the Gelber Center, beginning with Jacob Posel presenting Certificates of Congratulations to 10 members of the club for turning 90. 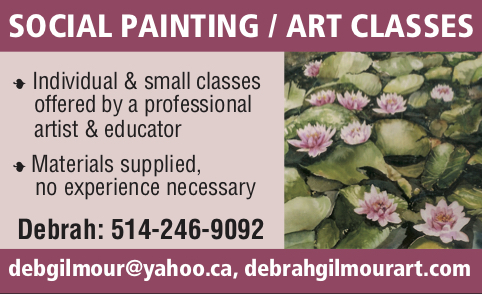 Phil Goldberg, the Club’s in-house art instructor, concluded the evening by presenting a seven- by three-foot painting depicting 185 portraits of club members and their wives or significant others to the City of Côte St. Luc. Mayor Anthony Housefather accepted the painting by artist Phil Kurtz. From left, receiving certificates of congratulations upon being 90: Steven Hopman, Michael Lansky, Aubrey Smofsky, Benny Bosker, Alan Sonny Rubin, Ben Abugov, Herby Paperman, Solomon Susser, Sydney Strulovitch; not shown is Frank Lemco. Be the first to comment on "Côte St. Luc Senior Men’s Club: Look who’s 90"